I will be the first to admit, I have a pretty boring pantry. We always have our essentials such as rice (fifty pounds to be exact), quinoa, oats, beans, and a variety of flours; however, we rarely have anything fun. Simply because things that we constitute as fun are also expensive or terrible for you. Every time I went to the grocery store, I would consider picking up a few bags of nuts or seeds to keep in the house, but just couldn't justify spending an extra $10-15 dollars on one bag of nuts. I know that doesn't sound like a lot, but knowing that I could buy two fillets of salmon for $12, or one bag of cashews for $11, the cons always outweighed the pros for our budget. 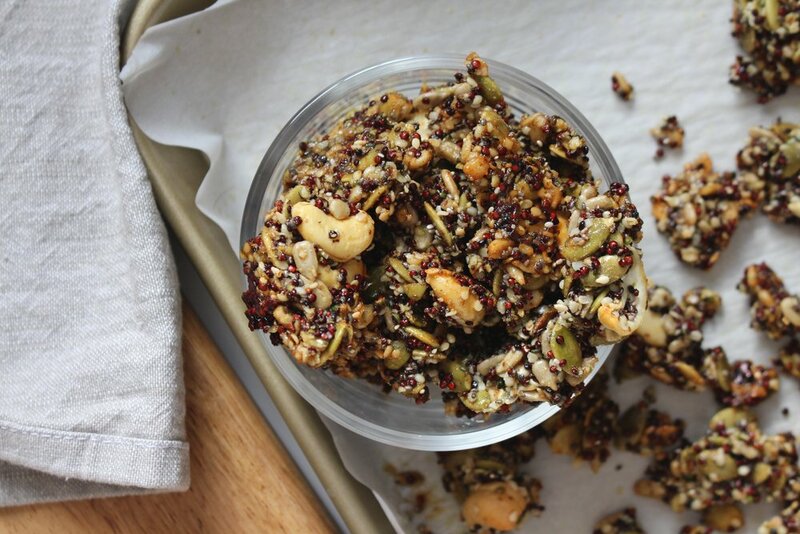 Nuts and seeds are fun, and you can add them to just about anything for some extra healthy fats and protein. Everyone uses them for oatmeal toppings, in breads and muffins, or even just in a simple tail mix. I wanted this same fun in my life so I didn't give up, I did my research and I thrive... found Thrive Market! Of course I've seen the commercials and heard other bloggers rave about it, but I didn't think it would be something I was interested in. I really enjoy going to the grocery store and hand-picking all of my groceries, so any type of online market didn't even cross my mind - until I wanted/needed something that our grocery stores didn't have/marked up in price - you know, one of the biggest reasons to purchase groceries online! Thrive Market is practically an online Whole Foods, minus the outrageous prices and jam-packed checkout lines. It has hundreds of all natural, name brand products, and sells it at the best possible price. Thrive also has their own line of products and are generally even more affordable than the big names. Being a generic loving, budget friendly type of gal - this was a huge deal for me! I was still on the fence about signing up because it is a membership and you do have to pay an annual fee of $60.00. Again, weighting out the pros and cons - sixty bucks is a grocery bill of itself for us so yikes. As I was about to close the page and miss out on all things fun, I came across a link for students, teachers, veterans, and a few others. And although I'm only a student for a few more months, I figured I my as well see if they offered any sort of student discount as most distributors do. As it turns out, Thrive has a student/teacher/etc. program that weaves your registration fee and allows you to become a member, order their products, and still get all of the amazing discounts. Yup, our pantry was about to get really, really fun. Another perk is free shipping after you spend $49.00, and when it comes to purchasing fun brands that we don't have around here, that was going to be easy! For my first purchase, I ordered one pound bags of Thrive Market sunflower seeds, pumpkin seeds, whole cashews, coconut chips, and cacao nibs. I also ordered a few bags of Purely Elizabeth's probiotic granola, Hemp Hearts, and some garbanzo bean flour for future recipes. My total was under $55, free shipping and no tax. Buying this many products at this volume from a grocery store, would have been well over $60-70! I received my package within three days and was shocked by how well everything was organized and securely packed. Thrive Market products are everything that I hoped they would be and I am so pleased with my purchase. We've been enjoying all of our new, fun pantry items so much and I can't wait to order more! In honor of my over excitement, I had to make a grain free granola recipe with all of our favorite seeds. I was first introduced to the idea of grain free granola when I worked for a small local health food shop and everyone raved about it. I personally don't have a grain intolerance of any sort and enjoy a big bowl of oatmeal every now and again. But I know that many of us try to limit grains in the diet and that's totally fine too! 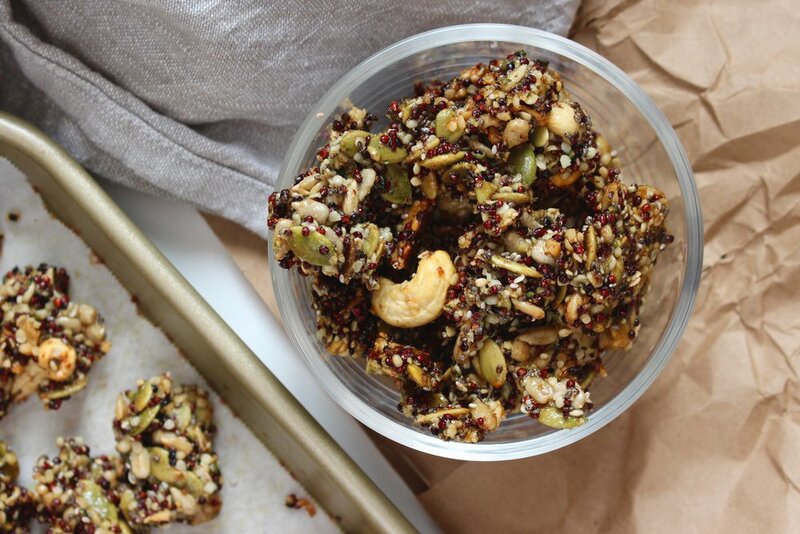 This recipe is super easy to make and packed with omega-3's, protein, and plenty of minerals. I do use organic butter and honey for this recipe, but I will list a few alternatives below. I will warn you, these granola clusters are addicting! They are naturally sweetened with honey, zero refined sugar added, and are totally grain free. I hope you love this recipe as much as we do, it's definitely going down as a new favorite! To begin, preheat the oven to 275ºF and line a baking sheet with parchment paper. Using a large frying pan, lightly toast the quinoa and sesame seeds over medium heat. 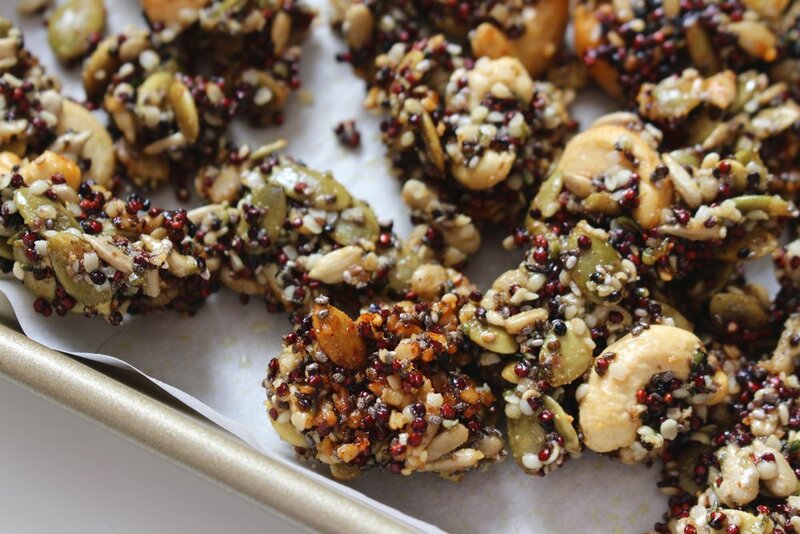 To do this, simply add quinoa and sesame seeds to the pan over medium heat, and mix around until the seeds are golden. While toasting, combine the sunflower seeds, pumpkin seeds, chia seeds, hemp hearts, cashews, and protein powder in a large mixing bowl. Stir together until fully incorporated. Add the seeds to the frying pan, as well as the butter and honey, and continue stirring until the butter has fully melted and the seed mixture is combined. Carefully pour the warm mixture onto a parchment lined baking sheet and spread out evenly. Place the baking sheet in the oven and bake for 15-20 minutes, or until the top of the granola begins to brown. Take out and let cool completely before breaking apart. I let my granola sit in the fridge for at least 2 hours to ensure everything is packed together. Once cool, break or tear apart and enjoy! I would recommend storing this granola in an airtight container in the refrigerator to preserve freshness and texture.